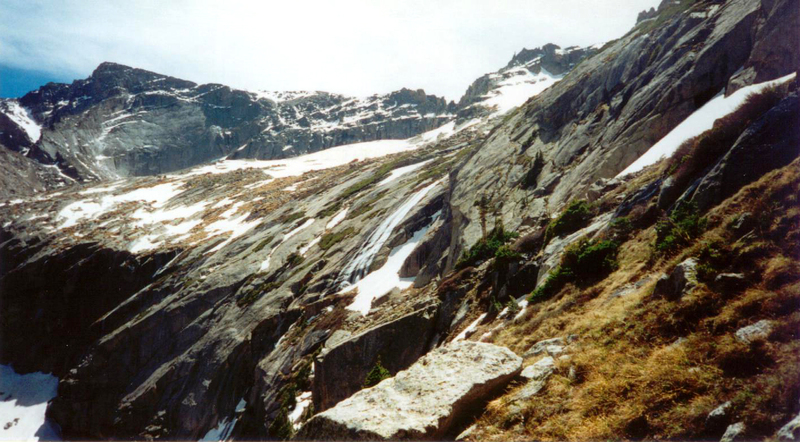 A low altitude illustration of the 'off-trail' ascending and descending required to complete the 'Solitude Lake Cirque'. It was finally time to do it. 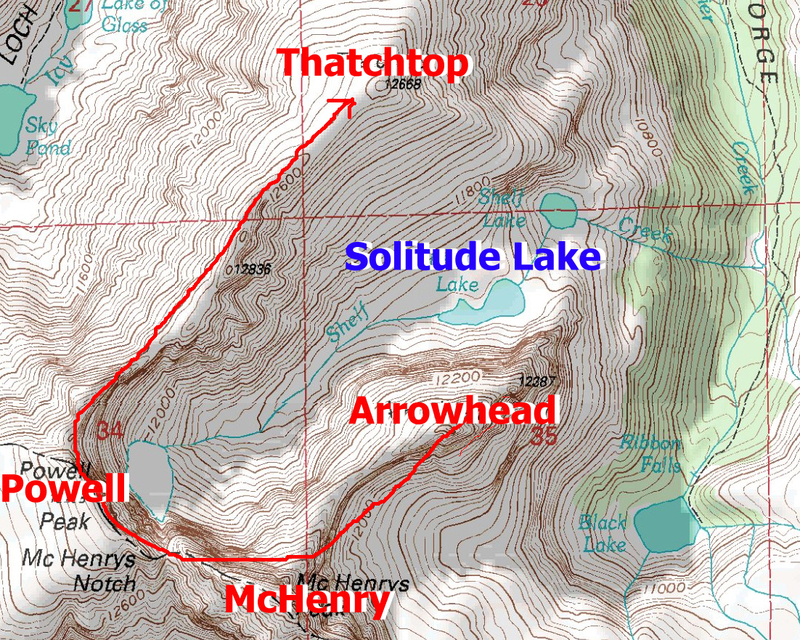 After many years of thinking about the various connected pieces, it was time to attempt the entire Solitude Lake Cirque: a climb of Arrowhead (3rd or 4th class) from Solitude Lake, then traversing to and climbing McHenrys’ NE Arete (4th Class) to the summit, then traversing McHenrys’ Notch (5th class downclimb and 2nd class scramble) to reach the summit of Mt Powell, and then traversing and downclimbing Mt Powell’s entire NE Ridge (4th class) to the summit of Thatchtop. We knew it would be a long day. Even if everything worked out perfectly, it would be a grueling, body-breaking day: over 13 hours, 11.5 miles, and 5140′ of elevation gain & loss, with much of it being off trail. 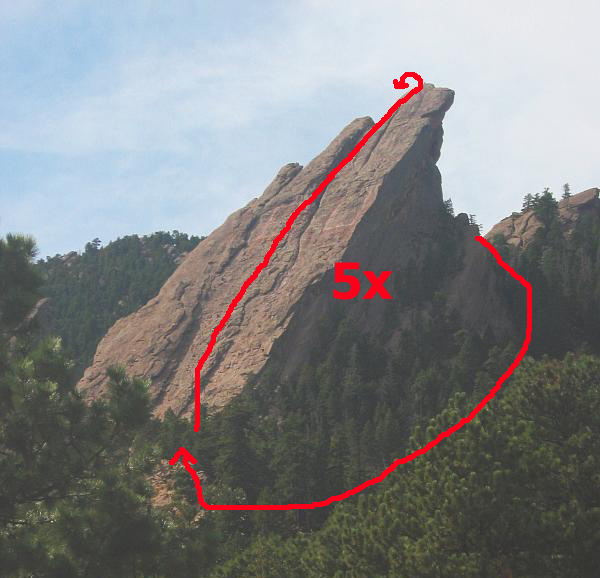 For illustration purposes, the planned effort is similar to scrambling up and down the 3rd Flatiron five times in a row with a mouth-full of water (to simulate high altitude oxygen availability). Fun, right? 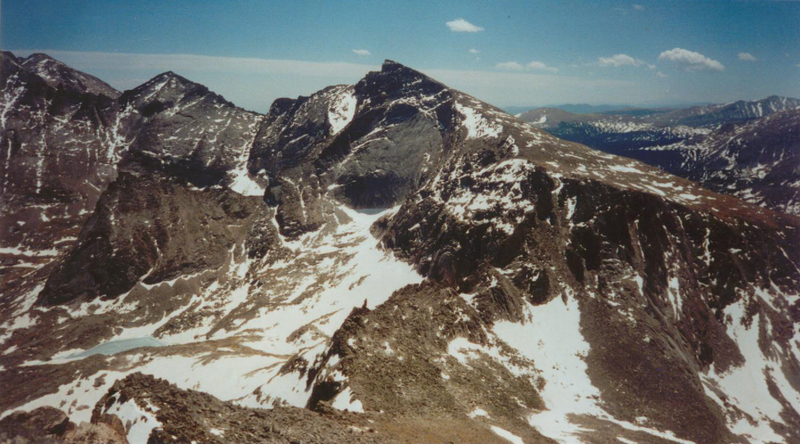 The ‘McHenrys Notch’ piece: I learned of ‘The Notch’ when sitting on top of Flattop during the summer of 1997 and wondering out loud about hiking the Continental Divide to Chiefs Head. Brian notified me that ‘The Notch‘ was a challenging obstacle. I was intrigued. 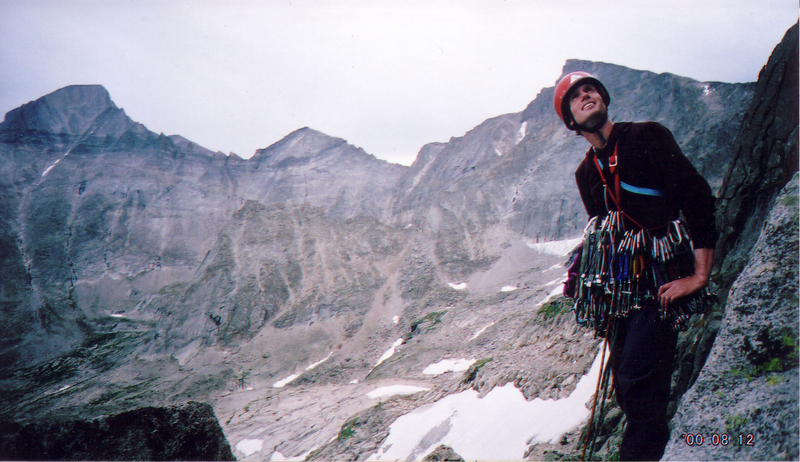 The ‘NE Arete of McHenrys’ piece: I still vividly remember looking up the NE Arete of McHenrys while sitting on the summit of Arrowhead in 1999 and thinking that it was the most spectacular sight I’d ever seen; I also thought it looked way too scary to to climb unroped (only 4th class). The ‘NE Ridge of Powell’ piece: I climbed this ridge almost exactly 11 years earlier in a solo effort; it was a near disastrous day as a late start and rainy weather nearly ended my climbing days (and every other kind as well). While my ability to do it while wet was confidence inspiring, the experience was psychologically traumatic. Brian and I attempted to repeat it in late 2005 but were turned back by heavy snowfall. 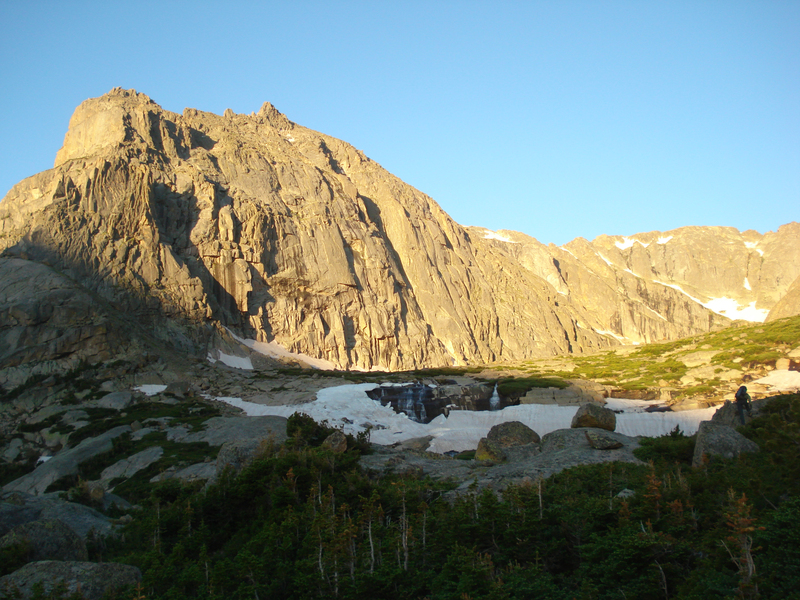 The ‘Do Them All Together’ Goal: in early 2010, I informed Brian that the ‘Solitude Lake Cirque‘ was a goal for the 2010 summer. 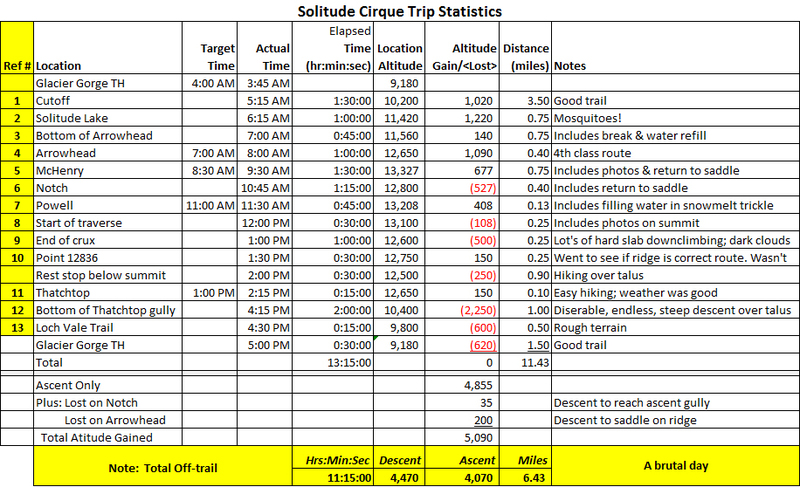 The Plan: during the last week of June, I decided that we’d do the climb clockwise. Even though The Notch is easier to climb than descend, I worried that a descent of McHenrys NE Arete would be too hard (since I didn’t know the terrain at all); and I thought we’d could rappel ‘The Notch’ if necessary. And, I didn’t think a down climb of Powell’s NE Ridge would be much harder than an ascent since the elevation change was small. I was very wrong about this last point. And, throwing a monkey wrench into the works, the weather report was not perfect. A “20% chance of rain after 1pm” was very worrying since it meant the rain would come while we were on Powell’s NE Ridge. Given my history with that chunk of rock, I was justifiably worried. In addition, the weekend before a forecast of only 10% chance of rain after 1pm came 100% true on a climb of Spearhead in RMNP; I just couldn’t ignore the threat. However, Brian and I worked it out that we could summit Thatchtop by 1pm, if we started @ 4am and moved at a quick pace. That was somewhat reassuring, but I wondered how long we could keep up such a pace. 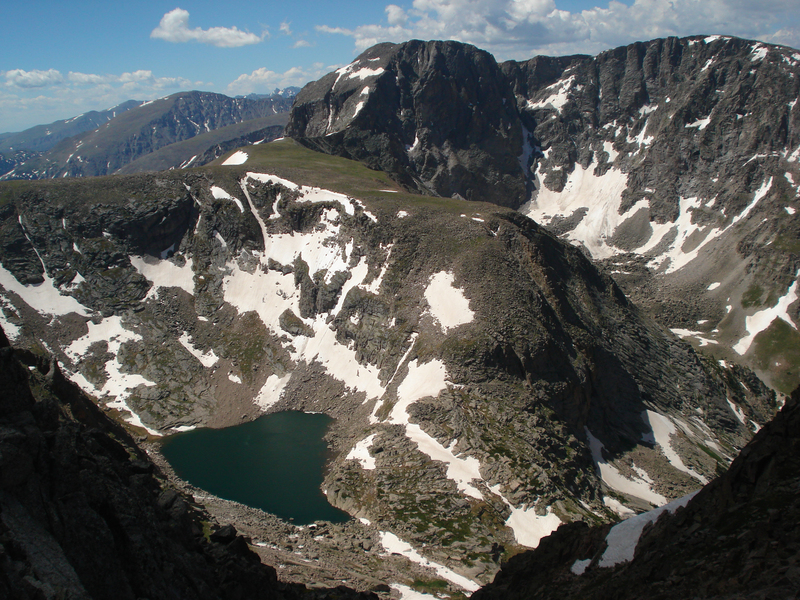 For better or worse, the ‘Solitude Lake Cirque‘ was a go! 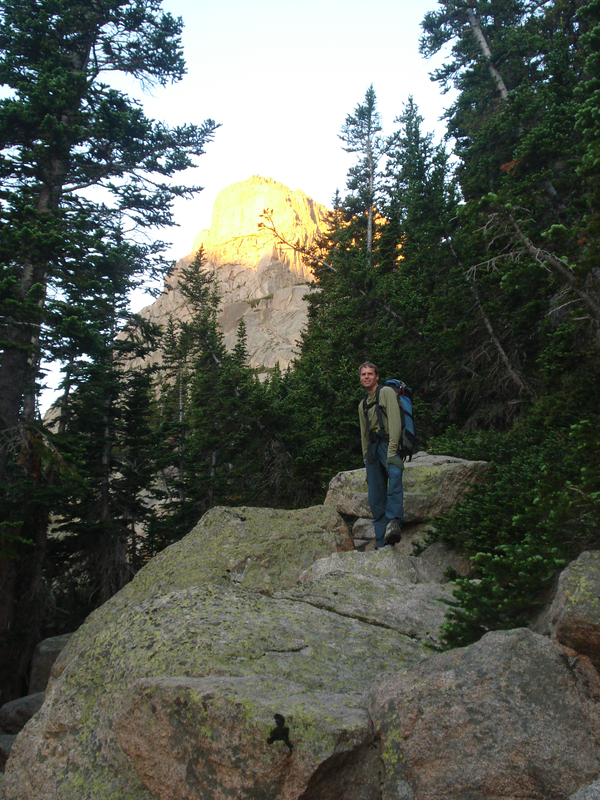 On the morning of July 3rd, 2010, Brian and I left Boulder@ 2:30am for the Glacier Gorge trailhead in Rocky Mountain National Park. Unlike the previous week, the sky was mostly clear; it was a good sign on a day when good weather might be required to survive. I was driving, so we arrived at the trailhead a bit earlier than planned. We started hiking at 3:45am. We took the ‘Knobs‘ shortcut to save 1/2 mile, and then took the Black Lake fork off the Loch Vale trail. About 3.5 miles in, we reached the avalanche gully which marked the cutoff for Solitude Lake. We turned toward Glacier Creek, gingerly walked along fallen logs to avoid sloshing through the marshy terrain. A quick hop across the creek and then we scrambled up the steep slope to reach the Shelf Lake area, swatting mosquitoes all the way up. On one of the longest days of the year (daylight-wise), it was light enough that we could have started hiking 30 minutes earlier. It was Brian’s turn to dunk a boot, this time working across the Shelf Lake outlet. But Brian was smart enough to wax his boots, so no wet foot for Brian (unlike my experience on Spearhead the week before). We reached the edge of Solitude Lake at 6:15am; I was delighted with our quick pace. I thought we would be close to my goal of a 7am Arrowhead summit. But clearly I had forgotten about the long talus-hop needed to reach the base of the Arrowhead climb. It took us another 45 minutes to reach the base of the climb. We started up a 4th class path Brian picked out; he didn’t want to use the 3rd class route we’d used before. I figured it would be a good warm up for climbing to come later in the day. Rather than angle directly for the Arrowhead summit, I decided to climb to the ridgeline first. I was rewarded with spectacular views of Glacier Gorge through the clear, early morning air. I then joined Brian on the summit of Arrowhead at 8am. We were already one hour behind schedule. It was time to start going faster, somehow. The weather looked good, but we could see the winds above McHenry were moving very quickly. We started back down the ridge toward the saddle, and then up the NE Arete. 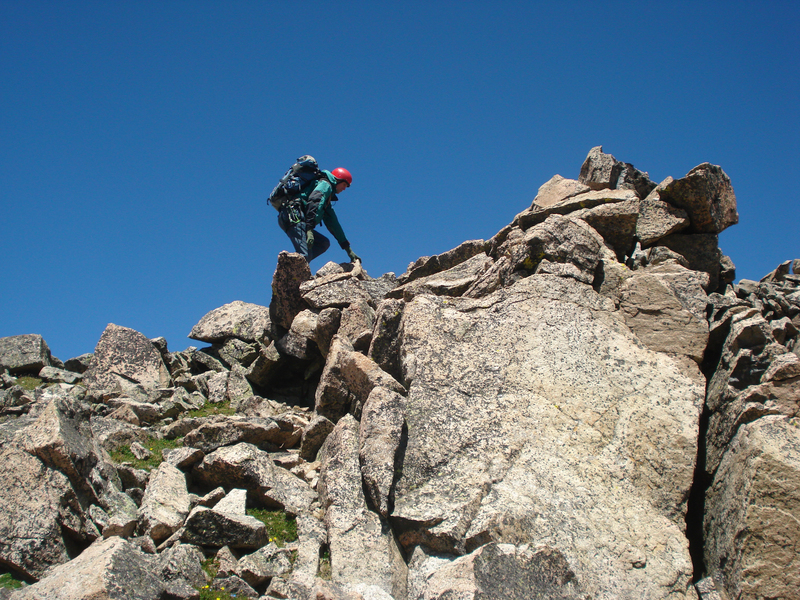 The climbing was not very difficult; there were a few spots of harder climbing below the Gendarmes on the ridge. I was pleasantly surprised to find that the climbing was nearly all 3rd class, with only a spot or two of 4th class. Accordingly, our time was pretty good, even though I was slowing down a bit after over 4300′ of elevation gain in the last 5+ hours. The finish was remarkably easy and led to within a few yards of the summit. A great route. 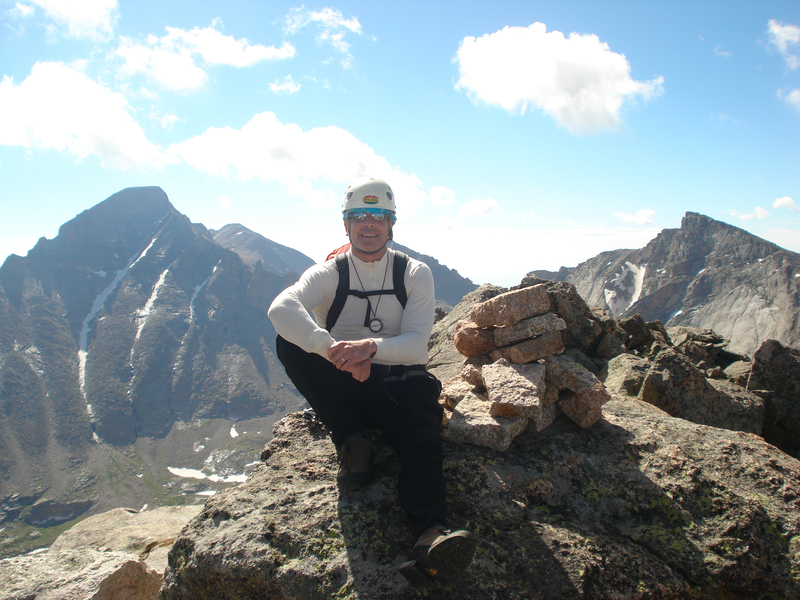 Joe (me) on McHenrys summit with Longs and Chiefs Head in the distance. 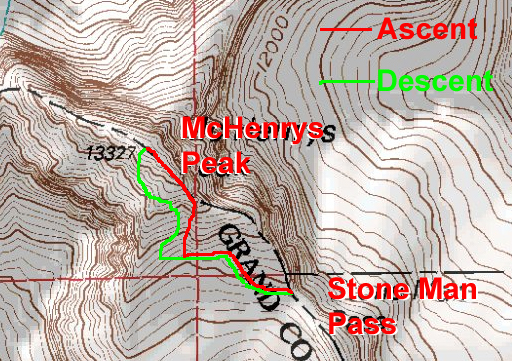 We reached McHenrys summit at 9:30am; still one hour behind schedule, but at least no further time was lost. And the wind was cold and strong. After a short break, we started toward The Notch. Progress was easy for a while, but then became confusing. It was unclear which ledge was the correct ledge to take to the downclimb. We decided to stay on the ridge crest as long as possible, which forced us to make an exposed move or two to reach the end. From that position, we could see that the ledge below us had been the correct ledge; we downclimbed to it and then traversed over to the gully that led directly to the top of ‘The Notch‘. Brian put on his rock shoes (removing Makalus); this says it all. It was steep. Plus, the freezing wind rushing up the gully was enough to unnerve anyone. At first, the downclimb felt very hard; but that was just me getting used to the awkward nature of downclimbing steep terrain. The holds were good and we made good time for a bit. 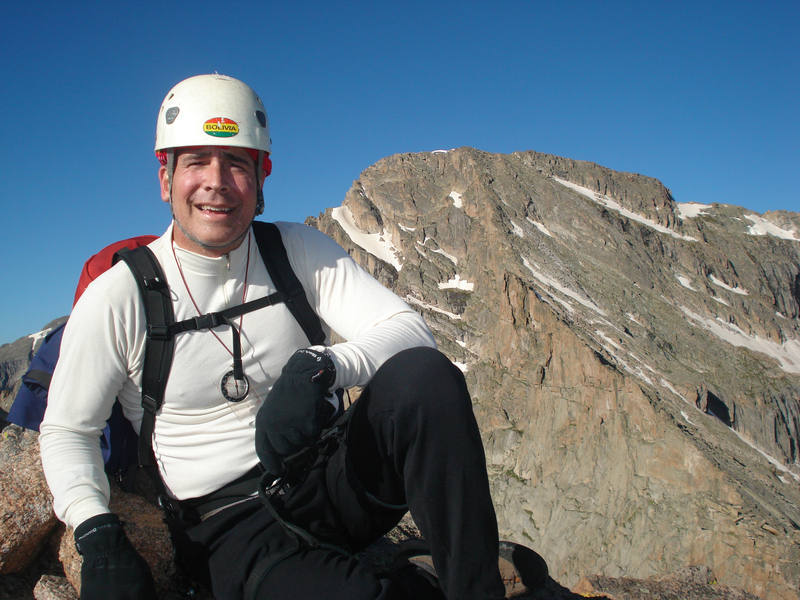 After about 100 feet, Brian found a rappel anchor and thought we should do a belayed downclimb. I was thinking we were past the hard part, but I rarely argue for less protection. Brian was right. The next 150 feet was harder. We had brought a small rack, so it took some doing to put in gear for Brian’s protection. And we were both freezing in the wind. 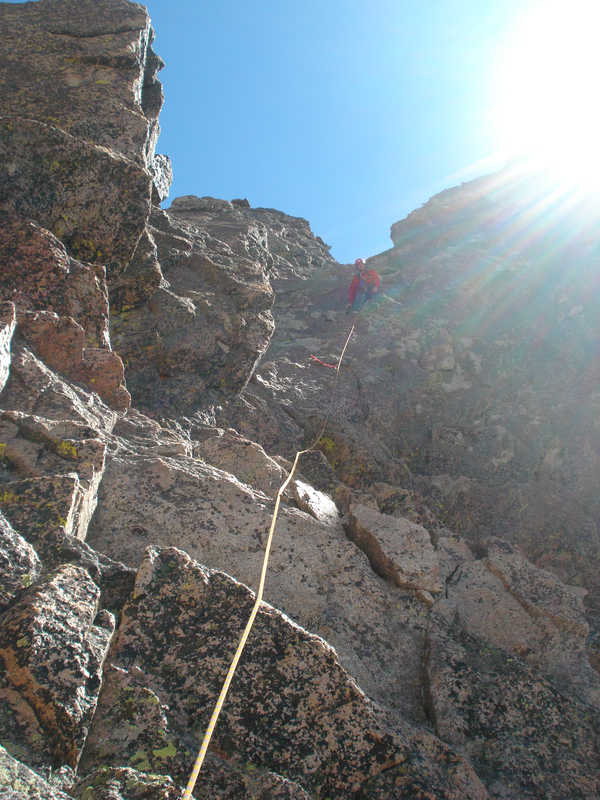 I reached the bottom of the gully at 10:45am and worked my way into the sunshine before stopping to give Brian a belay. He came down quickly and joined me in the sunshine to warm up. The downclimbing was good due to the solid hand holds; it was a luxury we would miss later in the day while downclimbing slabs. We wandered over to the edge of The Notch to have a look and also gathered in some great views of Powell Lake and Mt Alice. We also marveled at the great looking rock marking the Powell edge of The Notch; still, we were happy to have an alternative to escape The Notch. Brian led the way down The Notch to reach the gully we could ascend to reach the top of Mt Powell. On the way up, I was delighted to find a trickle of snow-melt running over a rock that I could use to refill my empty water bottle. I was very worried about not having more water for the rest of the day; it was only 11am. I silently wished for 2 bottles to fill. Brian moved ahead and I followed as soon as my full bottle was put away. The gully was a bit loose, but not too bad; a mere 2nd class scramble. Looking back at McHenry from the summit of Powell, with Longs and Chiefs Head in the background. We reached the summit of Mt Powell at 11:30am; we had picked up 30 minutes against our schedule and were now only 30 minutes behind schedule. And 3 peaks down; only 1 more to go! I realized that I had never been on the summit before. The time I thought I had summited, on my trip up the NE Ridge from Thatchtop in the rain, I must have stopped at the false summit some yards to the north. Well, better late than never. And, now I was feeling very confident. While the weather was getting worse, it looked like it would hold out until 1pm….just a few dark clouds so far. We didn’t even have to discuss our plan B of descending Andrews Glacier. I was thinking, ‘how long could it take to complete the NE Ridge’? The reports of the ridge taking 4 hours seemed ridiculous. We hiked toward Mt Taylor for about 200 feet and found a keyhole to slide through to get onto Powell’s NE Ridge. We then had to navigate a few feet of snow to reach the climbing, but that was the only snow we had to contend with all day. Finally, the only real hurdle remaining was the crux section of the NE Ridge; the section that I struggled so terribly with all those years ago. If we got past that section of the ridge, we would certainly make it. 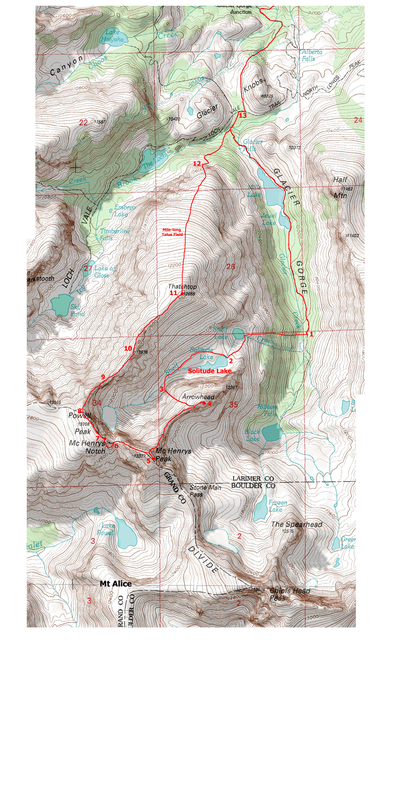 If the rain came before, we’d have to rope up if not turn back for Andrews Glacier. But the remaining hour before 1pm would surely be enough, wouldn’t it? 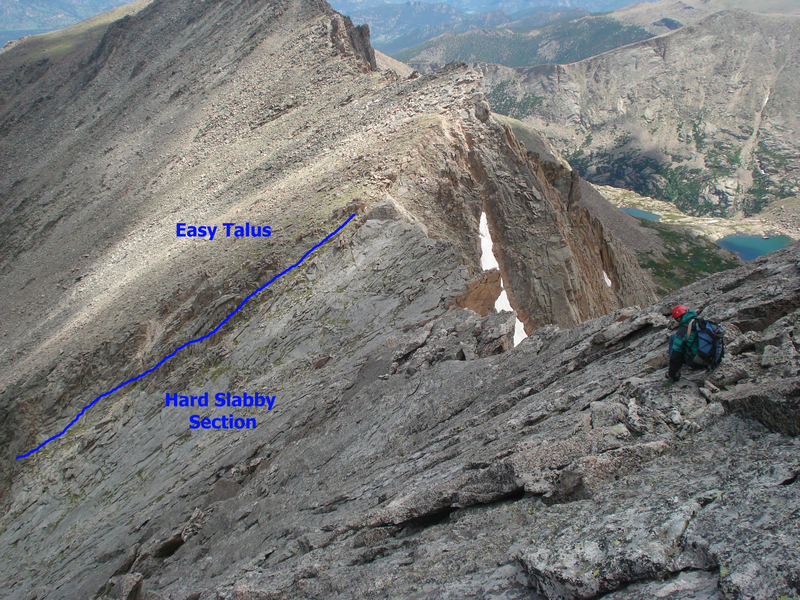 I had budgeted 2 hours to do the entire NE Ridge; it took us 2 hours to just to finish the hard section. Fortunately, the weather stayed dry. The wind was unnerving as it tossed us around while we smeared our way across and down the slabs, but at least the rock was good for sticky rubber. Once past the hard section, I told Brian that I had followed the ridgeline all those years ago (which is also Roach’s instructions; I checked). Brian said he liked the look of the talus below the ridgeline. I wondered if there was a reason for Roach’s advice and so I angled up to the ridge near Point 12836 to see if the ridgeline was a better path. 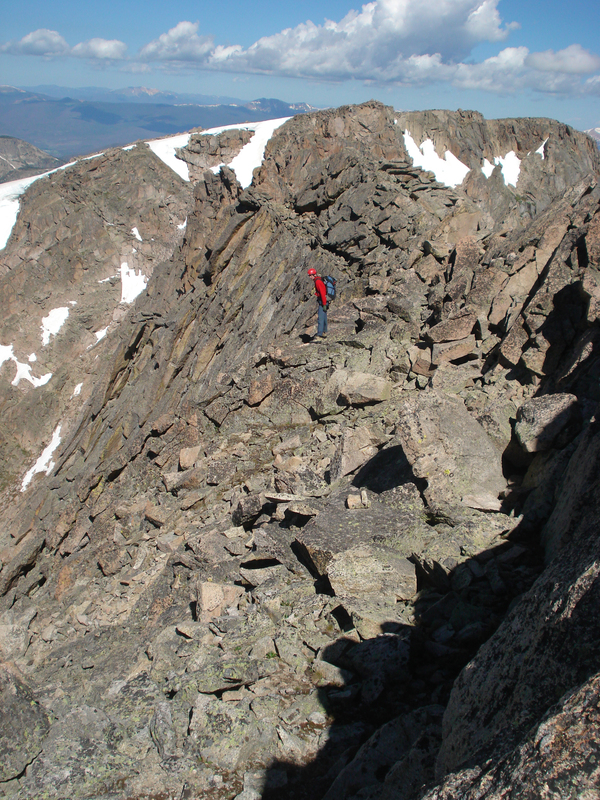 Instead, I found the ridge was much harder than the talus below, so I descend to match Brian’s path. At a little before 2pm (and the weather still holding), I found Brian resting below the summit of Thatchtop. In his green jacket, I couldn’t see him until I was within rock throwing distance. He looked so comfortable, I couldn’t resist the temptation, and so I stretched out on a grassy patch. It turned out that he wasn’t comfortable so much as sleepy. I finished my water and ate a snack, and I remarked to Brian that I would be willing to pay a lot to have the truck close-by. 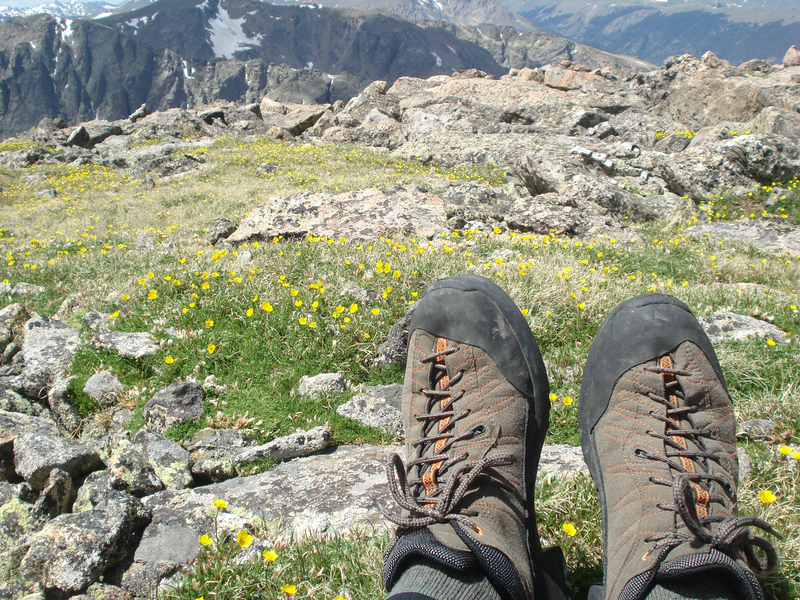 The thought of descending thousands of feet and multiple miles just shriveled my morale. All I had left to comfort me were my own words of advice: the greater the suffering, the greater the feeling of accomplishment. Misery Axiom: never turn back because of mental misery. More mental suffering (e.g., boredom, frustration, irritation) leads to more personal rewards, which can only be harvested through perseverance (corollary to Reward Rule). But we had many miles to go, as it has been said before. We trudged up to the summit of Thatchtop, and I stopped for a photo of our day’s route. 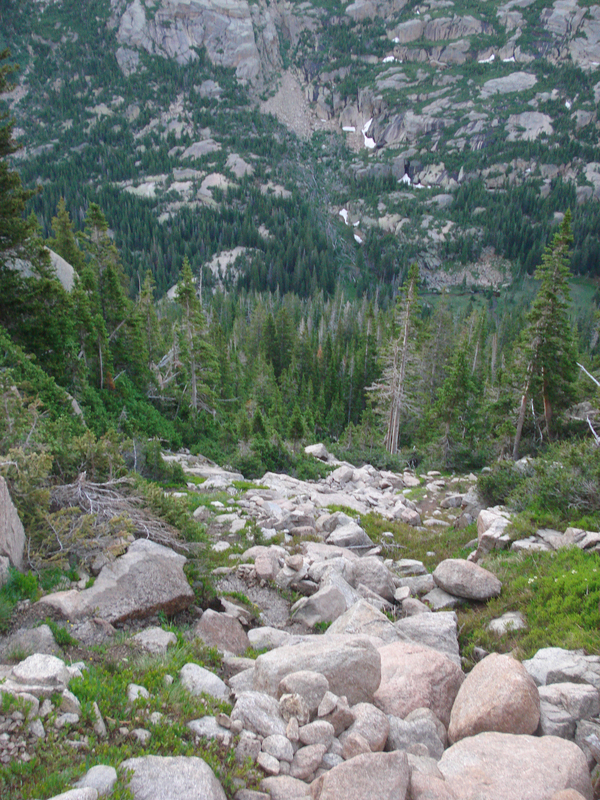 Brian hadn’t stopped, so I hurried after him, working my way down the endless talus field. It was another mile of talus hoping to reach the bottom of Thatchtop. And at the end of such a long day, it was an endless misery. Thatchtop’s name is appropriate from a long distance, but becomes supremely aggravating when one is actually on it and trying to hike over the ‘thatch’. And that wasn’t the end. We still had to find the descent gully, which somehow eluded us. After wandering through the peculiar stunted forested area at the end of the ridge, we finally stumbled upon the gully. The gully turned out to be far more loose than I recalled; we slipped and slid down and around the corner before finally escaping. And that wasn’t the end either. We still had to work our way down the mixed forest/talus field to reach the creek flowing from Loch Vale. It was a level of effort I was not prepared to expend. I was really beat. I don’t think I’ve ever done so much off-trail descending. 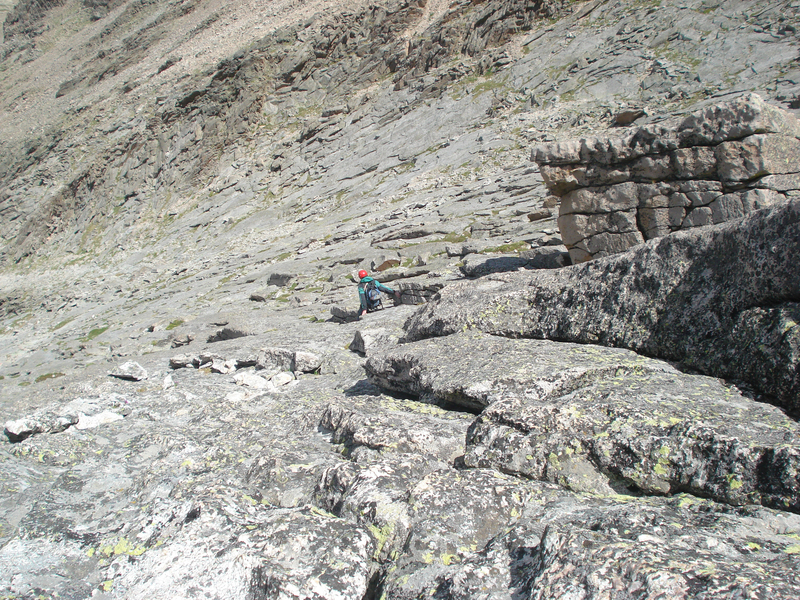 To get down, we had to descend over 4000′ down talus and technical rock. 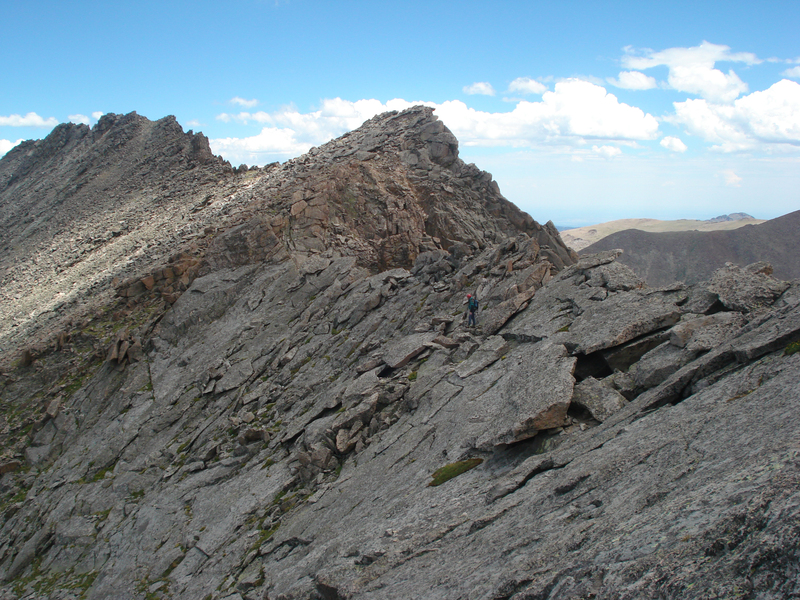 Try hiking down Longs Peak without using any trails..
And still we had to hike another 30 minutes to reach the car. What a day! I’m glad we did it. I’m glad it’s over. 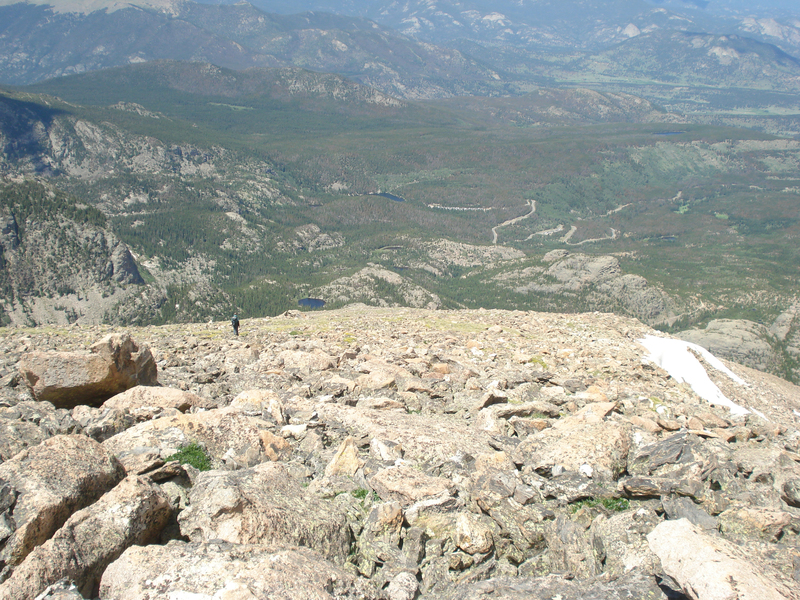 Brian dug deeply into his copy of Rossiter’s High Peaks book of RMNP alpine climbs and found Dog Star (5.8). 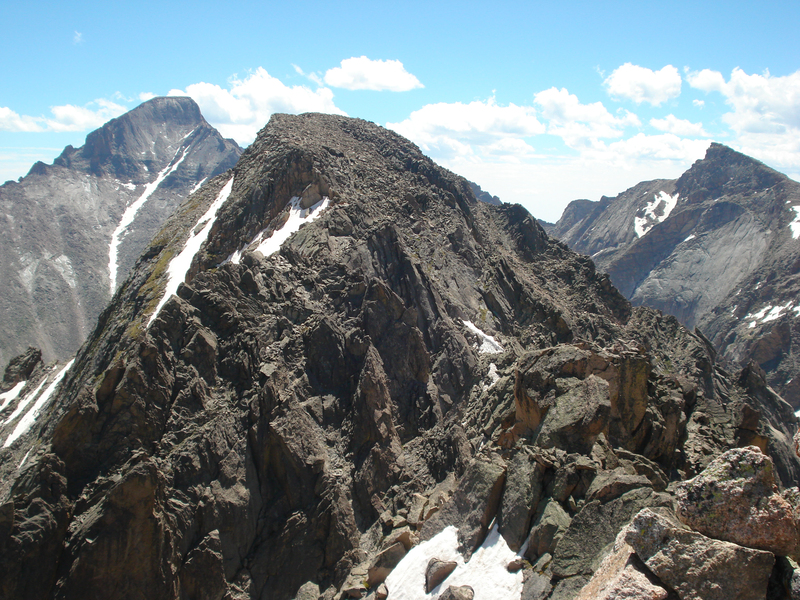 When Brian introduced the idea, I was interested right away because I had long wanted to climb McHenrys Peak. 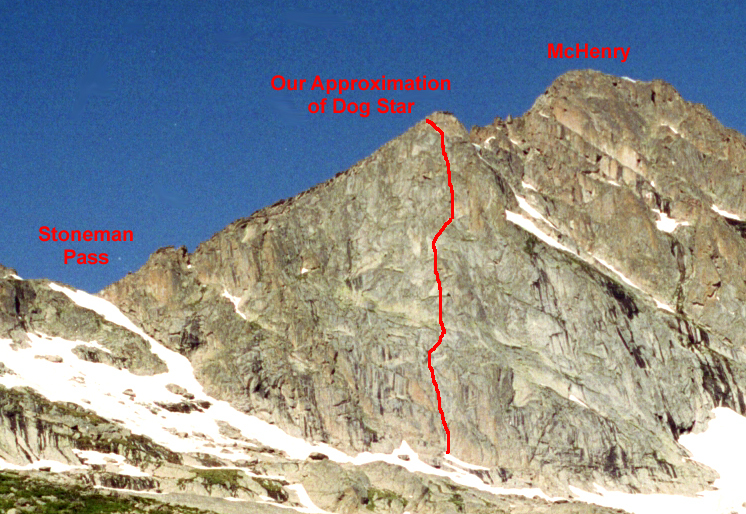 And I love the adventure of climbing up a big alpine wall; Dog Star is recommended in multiple guide books. But this trip is documented here due to the epic nature of the climb, only partially caused by illness. We started hiking from the old Glacier Gorge parking lot @ 4am expecting to make our normal fast pace, but I was off. My body just wouldn’t cooperate with my cerebral wishes and its own best interests; but I suppose losing some of my altitude tolerance (spending 5 of 7 days in Atlanta for the last 3 months) and failing to get a minute of sleep the night before was just too much for my old body. I hiked as fast as I could (read: slow), and we reached Black Lake a little after sunrise, around 6:30am. 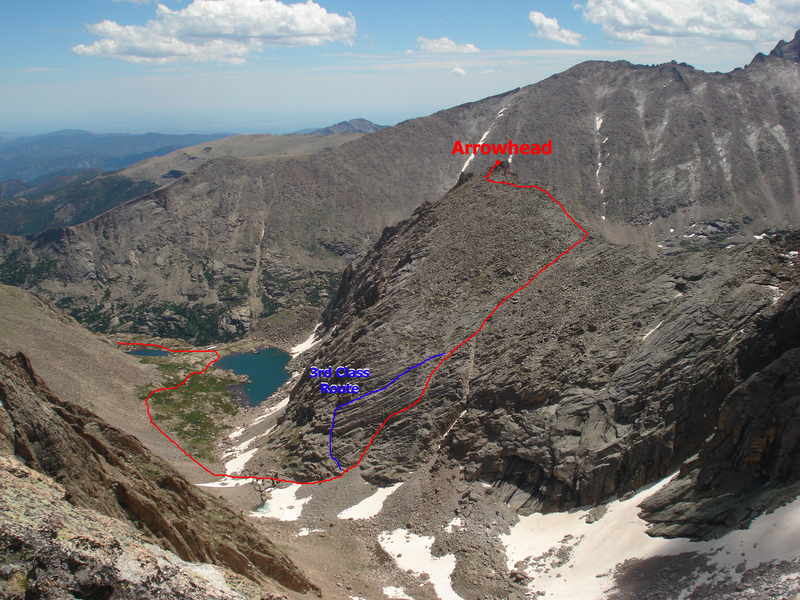 We took our normal shortcut toward Arrowhead from Black Lake and worked our way up to the large triangular buttress that dominates McHenry’s northeast face. At 7:30am, we stopped a few hundred yards below the face to study the rock and find our bearings. While Brian studied, I slept. Once we started, it felt like we were off-route half the time. And it wasn’t just me (sleepy head). We both seemed to spend much of the day figuring out where we were and trying to get back to the route. Occasionally, we felt we were doing it right; but in the end, we were just glad to make it to the top. It was good rock, except for the plant life; we just had to follow our nose and hope we didn’t dead-end. “Faith” can be hard to come by, but without it, this day would have ended much sooner. 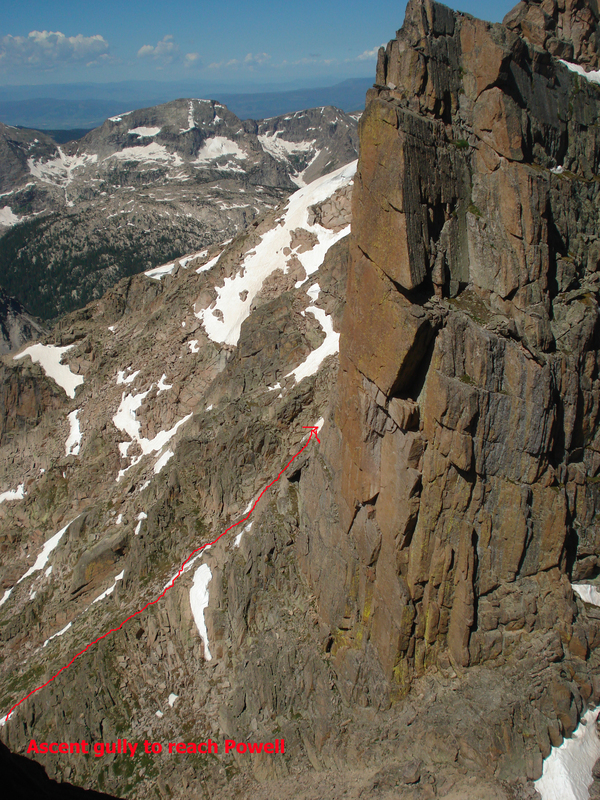 Pitch 2: Brian climbed the dihedral, requiring a hard pull over the lip without holds. He then turned a bulge on his left (route description seemed to point to right bulge) and belayed at ledge above the bulge. Pitch 4: Determined to feel better, I started up a curving ramp and reacquired the correct route (I believe). I belayed at big flake and felt bad enough to think death would be better. Pitch 6: Brian took a couple falls trying to free climb the bushy, mossy and, in addition, technically difficult roof. It was rated 5.8, but I’ll eat my computer if that is accurate. He resorted to aiding it so we didn’t have to spend the rest of our lives there. I angled up to the left on thin moves including a finger crack that held a solid cam. It looked like there was a ledge above that, but when I pulled my head up over the edge, it was actually sloping quite a bit. The finger crack was full of dirt and moss at that point. I fell trying to pull over the edge, and after that we were a bit demoralized. I stood on the cam to get onto the sloping ledge. After that were some roof moves. I remember that they actually had good holds and thinking that we could have free climbed them on a good day. But after the fall, I just wanted to be done with the pitch. Pitch 7: Brian led a rope length of hard, steep rock that took a bit of wandering to find the easiest climbing. Pitch 8: Brian continued up the steep section to reach a left-leaning ledge, which he followed to reach the top of the ridge. The correct route works straight up from the ledge, but I was ready to use a parachute to get off the rock. At the top, Brian waited for me to announce a decision on proceeding to the summit. I hate missing out on a summit when I am so close, but I bailed. If my leg was off, I would have tried. But nausea is an unfightable affliction. And I must have looked bad, too, because Brian took some of my half of the gear weight. Heading downhill made me feel better, if only psychologically. We worked down to Stone Man Pass, and then down the gully to reach the base of the climb. It was over except for the clean up (the boring hike out). We had done it, sort of. I regretted missing out on McHenrys Peak’s summit, but I knew I’d come back eventually (in 2 years, actually: see McHenrys At Last). We got back to the parking lot at 6:30pm for a 14.5 hour effort. I cannot say I recommend Dog Star or mountain sickness. But if only for the great memories, I do recommend aiming high. A bit of suffering seems to make all the difference. I had been looking at McHenrys Peak with great desire for many years and had been close twice, but had never quite set out to bag it. And McHenrys is not a peak to climb on a whim, or is it? 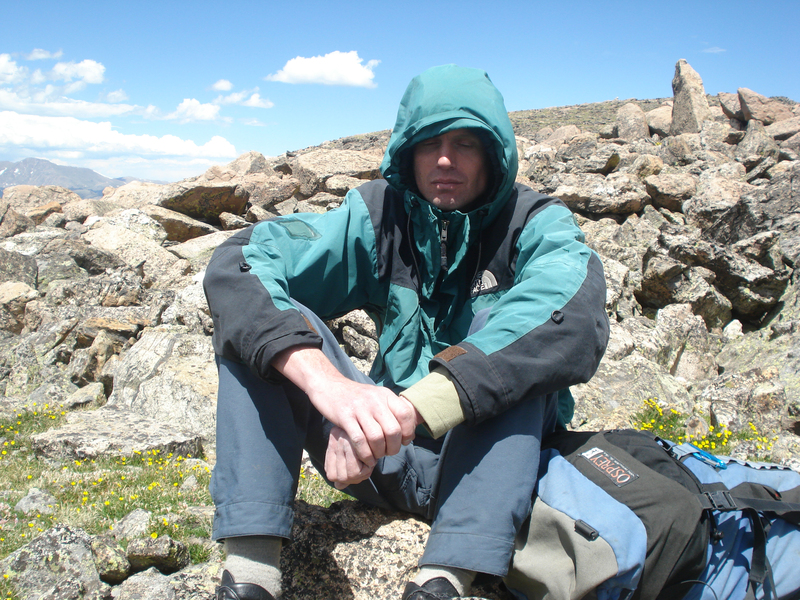 On June 2, 2002, Brian and I decided to visit Stone Man Pass for a bit of exercise. We didn’t think we’d move fast enough or weather would stay good long enough to do more. But we were mistaken. We left the parking lot at 6am and hiked 5 miles to Black Lake by 8am. The trail was in good shape even though it was mostly snow covered. 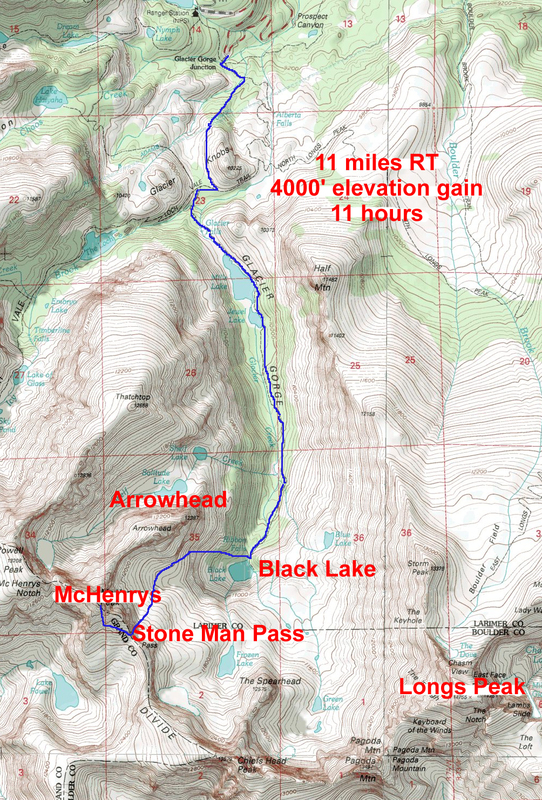 We decide to take a shortcut to the pass by heading directly toward Arrowhead, and by 10am we reached the bottom of the snowfield reaching toward Stone Man Pass. This snow was also in good shape and we reach the top of the pass at 11am. The conditions had allowed us to finish early; and the weather was too good to think about going home. While resting at the pass we looked around for something interesting. I looked to the summit of McHenrys, but hesitated. I thought it looked hard, even technical. But it was on the top of my wish list, so eventually I suggested we give it a go; Brian agreed. We didn’t have any route info aside from a vague memory Brian held of a descent of the route some years before (after climbing NE ridge), and snow covered anything that might look like a trail or a trail marker. We figured we’d just wander on up and see what we can see. I didn’t have any concerns, at least not at first. Our ascent (red) and descent (green) routes. Photo taken from climb of Chiefs Head. 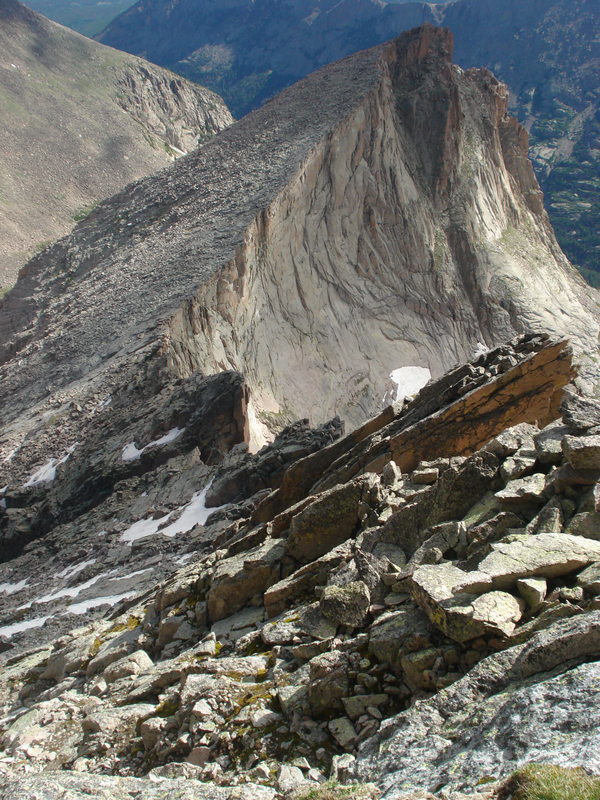 We wandered low to get around the first major buttress, and then went straight up the gully toward the summit. This path worked fine until near the top where the climbing got hard. It was big blocks and pillars that we had to climb up and around; I’d call it 4th class in spots. It was 5th class if not careful; I was not careful. I got stuck on a ledge with no good way off. I had made hard-to-reverse moves to gain the ledge thinking that I could escape it; but the only move I found was a dynamic one that would be fatal if I missed the mark. I just didn’t like it in my Makalus, so I just kept looking for anything else; and perhaps just delaying the inevitable. To my delight (and relief), I found a less risky move and took it. A short while later, I joined Brian on the summit. 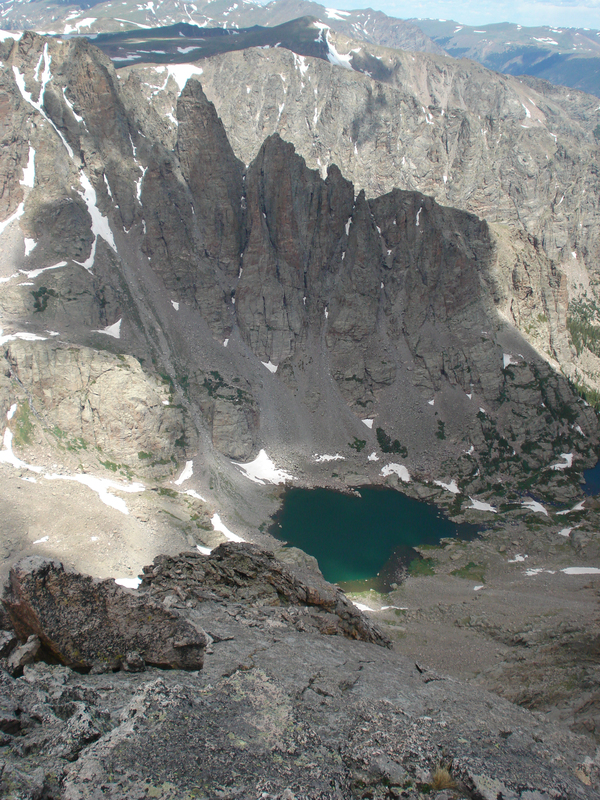 It is far better than any summit in RMNP; completely awe-inspiring. The valley floor drops away dramatically from all sides. It is a must climb. 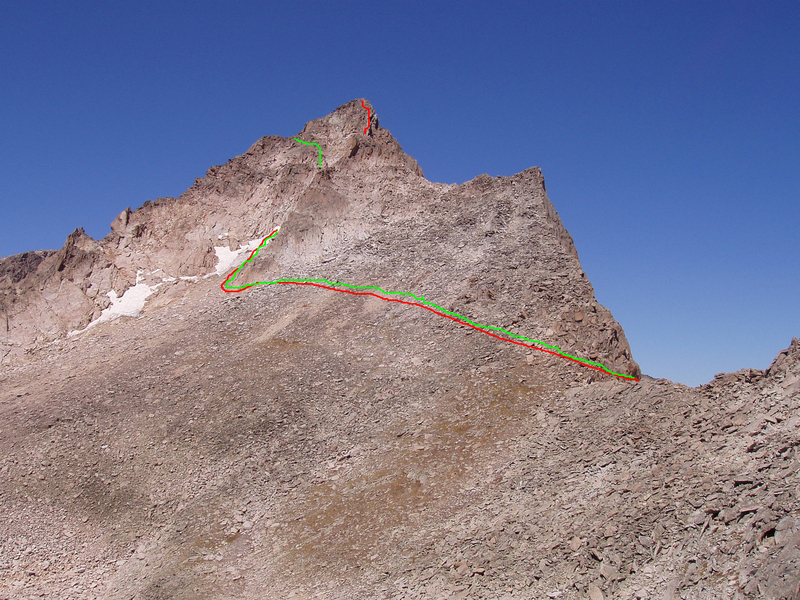 Our routes on McHenrys Peak; Red for ascent, Green for descent. The decent was easier and exhilarating. We found a better path on the way down (isn’t it always so?) to Stone Man Pass and then glissaded down from Stone Man Pass and later down the bench below Arrowhead to reach the Black Lake area. Another 2 hours of hiking got us back to the car for an 11 mile, 11 hour round trip. But I don’t recommend climbing McHenrys Peak on a whim. It is a peak that deserves respect, and some preparation.